This nylon bra is structured with a monowire, joined with a plunging U shape separator. The bustline has a dramatic pointed bust silhouette, achieved with numerous small darts fanning out from the centre front of each cup. The fine lace fabric is lined with an opaque woven nylon. Delicate lace trims the neckline and shoulder straps. The shoulder straps are adjustable with enamelled metal components. Strips of elastic at the centre back lend some fit flexibility, leading to an unusual closure formed of ‘pins’ and a loop (not a disimilar principle to traditional metal corset busks). The swing tag translates literally as ‘bubble of Rosy’, possible the name of the range this design came from. 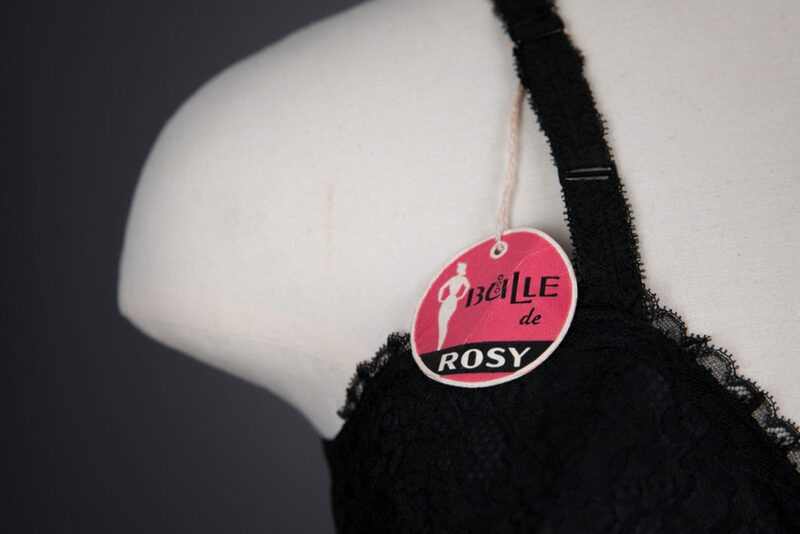 The Rosy lingerie brand was founded in 1947 in Paris, initially specialising in corsetry. The brand remained in business into the 2010s, but does not appear to have released any new collections for some time.